Spectralux was founded in 1973 to fill growing demands of the Boeing Company. We rapidly grew into an industry leader known for manufacturing high quality lighted products to commercial, business, and military aviation markets. Customer trust and reliance on Spectralux support, quality, design and manufacturing led to additional opportunities and the addition of increasingly complex electronic products, further expanding our systems and core competencies. In 1992, Spectralux developed processes and technologies that allowed the use of LED lighting in aviation products. These advancements enabled Spectralux to become the first sole supplier of lighted products for the 777 … Boeing’s first LED flight deck. In 2003, Spectralux entered the avionics market with FAA TSO approval for Dlink+ … the world’s first data communications system to combine three avionics modules (CMU, CDU, VDR) within a single LRU. 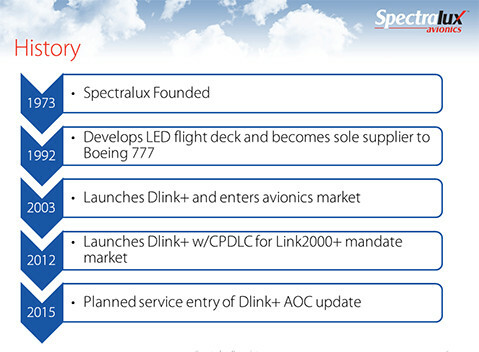 Expanding on the success of Dlink+, Spectralux in 2012 obtained FAA TSO approval for Dlink+ w/CPDLC … a datalink product with advanced ATN functionality to support the European Link 2000+ mandate for CPDLC. Moving into the future, Spectralux is working to expand the functionality of our datalink products in ways which make our customers … more efficient … more successful. Dlink+ AOC is poised to provide advanced AOC and ACARS functionality to achieve these goals.